I missed a call from Nike earlier today. They must've heard that I ran the ING New York Marathon earlier this month, and I figured they were calling to offer me a large endorsement deal. It's about time someone recognized my athletic prowess, I thought. My mind went back to the months of training it took to prepare to run more than 25 miles. It wasn't always easy. I thought about all the early morning runs. I thought about the planning for a dream that grew from a near disaster 16 months ago. On July 8, 2010, I suffered a heart attack and was told that I had a serious problem with one of my coronary arteries. No one knew immediately what it was, but I was told that I was in trouble. I was also asked if I had my affairs in order. That's not the kind of thing you ever forget. As I left my wife, Ali, for what I thought might be the last time, I handed her my phone and told her what to do if I died. We were both crying. I realized that I hadn't had the chance to say goodbye to my three sons. I actually had been training and trying to get in shape when I had the heart attack. That Thursday morning, I was getting ready to go to the gym when the symptoms started. Rushed to the hospital, I underwent an emergency procedure which saved my life. Medical staff told me I was one of the luckiest men alive; I had come within 10 minutes of being dead, but survived "The Widowmaker." After cardiac rehab, I decided that I needed a goal, and the New York Marathon seemed like an appropriate target -- at least to me. I decided to make a public commitment and told as many people as I could that I would run in it. Most people encouraged me, but some thought I was crazy -- including my cardiologist. I had to undergo rigorous stress tests and multiple procedures before I was cleared to begin 10 months of marathon training. I joined a wonderful charity called Team for Kids at the suggestion of my good friend Glen Wiener, a coach for the New York Road Runners Club. Team for Kids' members link their running to pledges for donations that provide health and recreation programs for needy children. And members are guaranteed entry in the marathon. I started training, quickly reached my fundraising goal and received encouraging emails from both the road runners club and Team for Kids. Marathon Day -- Nov. 6, 2011 -- was somewhere in the distant future. My first training run 10 months ago did not go so well. I made it about one-quarter mile before I had to stop and walk. But soon enough, I broke the one-mile barrier, then the three-mile mark. Three miles became five, and five miles became eight. As spring turned into summer, my training increased. Over the summer, I completed my first 15-mile run. I would like to say that my mind and body experienced the "runner's high" and that it was one of the best experiences of my life. But it wasn't. I often wondered why I was doing this. Nov. 5 soon arrived, and I found myself at a hotel in Times Square, not-so-ready for the New York Marathon the next day. My entire family went into the city to watch me run, and I was more concerned about embarrassing myself than about running 26.2 miles. Three weeks earlier, I had done a 20 mile tune-up race and strained my right knee. I was diagnosed with bursitis and given a cortisone shot and an anti-inflammatory. The orthopedist told me the bursitis was due to overtraining. I think it was the first time anyone told me I was working out too much. Marathon Day started at about 4:30 a.m. I left my hotel room at 5:15, walked to 51st Street and Sixth Avenue and caught my bus to the starting line in Staten Island. I met my friend Maria Kuckova at the Team for Kids tent. We had met three weeks earlier at the 20-mile tune-up race and had run together. We still had about three hours before the start of the race, so we spent time eating fruit, gel packs and power bars. At about 9:20 a.m. the announcement came that we were to proceed to the corrals. I walked to my designated gate and into the corral to go to the starting line. At the starting line, I met a large pink gorilla who was running with a large banana. I also met a Ben Franklin look-alike. I met a couple who was getting married that week, and I met several runners from Japan dressed as bunny rabbits. At 10:10 a.m. the announcement came that the race was starting. The cannon fired and, as one, I and 20,000 of my closest friends in Wave 2 of the 2011 ING New York City Marathon, started on our journey across New York City. I sent a text to my friends and family which read, "Well, I'm off. See you in 26.2 miles." It could not have been a more beautiful morning. I don't think anyone realizes the full mental aspect of running until you're in a race like this. Race race organizers place mile markers at each mile. At the beginning, it is quite depressing to realize that you've run the first mile but you're only halfway across the Verrazano Bridge. Our first water station came as we entered Brooklyn. I don't think any of us were prepared for what we were about to experience . The people of Brooklyn were among the most gracious I have ever encountered. I had never felt more positive energy and more encouragement than I did running through the County of Kings. All along the course we were met with cheers, encouragement and signs. People would high-five us as we ran past. They would shout our names. Many people held signs welcoming us to Brooklyn. Some were funny, others heartfelt. A woman held one that said "Welcome to Brooklyn, now get out." Another woman's sign read "You are so good-looking." I'd like to think she made the sign just for me, but I suspect it may have been for all of us. In many respects, running a marathon is quite peaceful. I found myself in a running rhythm which was almost hypnotic. You daydream. You think about your life. I thought about all that I had gone through to get to this point. Emotions and thoughts passed through my consciousness. Things would bubble up and then disappear. One feeling kept returning, again and again, throughout the five hours and thirty-one minutes that I ran through the streets of New York -- gratitude. Several times I was overcome to the point of tears. I thought about my family and how much they mean to me. After my heart attack, each of my three boys came to me at different times to talk about what I mean to them and how they felt when they thought they were about to lose me. My wife and I talked about our relationship and how we should cherish each other more. Over time, I talked to each of my family members. Some talks were serious, others were comedic. My brother Chris and I talked about how much we mean to each other. My brother Tom came to me and said, "Remember that time when you had the heart attack and almost died? Yeah, don't do that again." When I thought about it, I realized we were all saying the same thing -- "I love you." As the race progressed, peace and gratitude were periodically punctured by my body's response to the physical challenge. At mile 11, my thighs started to cramp. My knees were getting achy, and I started to feel a stabbing pain in my right knee, the one with bursitis. I started to worry that I might not be able to finish the run. I tried to walk it off, but nothing seemed to work. At that moment, I looked up and saw a woman holding a sign which read "Some day you will not be able to run a marathon. Today is not that day." I cried and felt renewed. I walked through the next water station and then started running again. The people of Queens welcomed us next. It's funny how each borough has its own feel, its own flavor. Queens was as hospitable as Brooklyn. There were signs and well-wishers. There were bands and people handing out fruit and candy all along the roadway. The people of Queens urged us on to Manhattan. I made it to the 59th Street Bridge and crossed over into Manhattan. I saw my family at 59th Street and First Avenue. They were holding signs. One sign read "Go Dad Go." My son Jamie held a sign which read "Something Encouraging." They all said I looked pretty good. I said that I looked better than I felt. But I was two-thirds of the way through and said I'd meet them in Central Park. I took pictures of them, and they took pictures of me. Then I was off, up First Avenue and into the Bronx. The people of the Bronx welcomed us with a band. The leader of the band screamed "Welcome to the Bronx!" The people cheered us, encouraged us and urged us on. We ultimately crossed over back into Manhattan. I felt optimistic when I saw the Mile 21 sign. I thought, "I am 80 percent of the way there." I actually started feeling like I was going to make it. I texted my friends when I passed Mile 24. We crossed over into Central Park and were met by several hundred thousand New Yorkers. They cheered us on and willed us to the finish line. When I crossed over onto Central Park South, I saw a sign which read "800 meters." People were holding other signs which read "You're almost there." One minute later I crossed back into Central Park for the last time and completed the 2011 ING New York City Marathon. So many emotions had coursed through me as I ran through the five boroughs. Many people were running for charities. People were running in memory of a father, mother, sister, brother, child -- too many to count. That had saddened me. So much pain in the world. But people had been trying to make this something positive. My charity raised more than $4 million that day. Members of our group all were running for other people but for ourselves, too. None of us had endorsement deals like the stars of the sport. None of us were professional runners. Ultimately, we all ran for our own reasons. Some public, many private. I am grateful for all of the runners who raised millions of dollars for people less fortunate than us. I am grateful to the people of Staten Island, Brooklyn, Queens, Manhattan and the Bronx. Thank you for being there for us. Thank you for every cheer, sign and high five. I am grateful for the thousands of volunteers who make this event possible. None of this could have happened without you. I am grateful to all of my friends and family who pledged donations for my run. Thank you for helping me be a part of a team that raised millions of dollars that will help 55,000 kids around the world. I love you. I am grateful for all of the charities that are supported through this race -- many of them health related. I hope that one day all of these illnesses are cured and at least some of the world's suffering is eased. I am grateful for all of the runners in the race. You inspire me. Thank you for your courage and thank you for your humanity. Sixteen months ago, I lay on a hospital bed, not sure if I was going to be alive in the next hour. 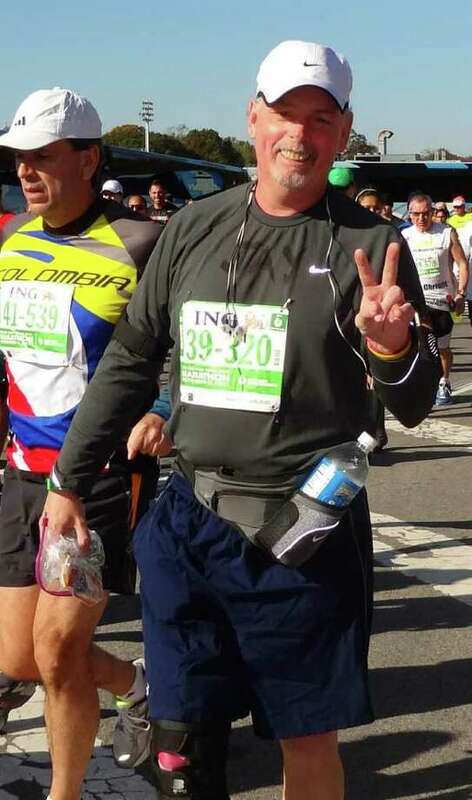 On Nov. 6, 2011, I ran 26.2 miles through the five boroughs of the greatest city in the world. For that I am grateful. Thank you, New York, for opening up your streets and your hearts to me and 48,000 of my closest friends. I know you will never remember me, but I will never forget you. Jay Skelton, Runner No. 39-320. I called Nike back. Turns out they were not offering the big endorsement deal I deserve. They told me the sneakers I ordered are on back order. But it's not all bad. My new running shoes will be in by the end of the year. I am grateful for that, too. Jay Skelton, 51, lives in Fairfield. He is a lawyer with a practice in town.